Later the notch shrank to a waterdrop cutout, as seen in Oppo and Huawei smartphones, and it looks like it will also appear on the Asus Zenfone 6. However, unlike those phones, this prototype is sporting the notch towards the right corner of the display. Looking through these new photos, we can also see that the ZenFone 6 will have a large-ish chin below the display, dual rear cameras, a USB-C port for charging, and even a 3.5mm headphone jack. The back of the phone has a dual rear camera setup - paired with an LED flash and a fingerprint sensor. At first you think the image is a bad joke, but after seeing the video people with mild OCD might be bothered and we cant judge them. Is this a trend you'd like to see more of? 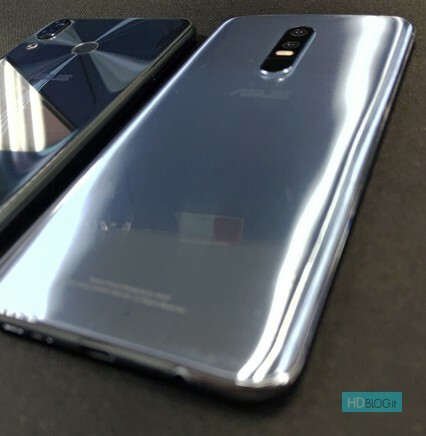 Italian site HDblog.it has posted numerous photos of what it believes to be the final Asus ZenFone 6 design that will be announced at MWC 2019 in Barcelona. The display camera hole approach seems to be becoming more and more popular, as a number of smartphone manufacturers seem to be planning to implement it in the near future. This was revealed in a recently-leaked hands-on video of the device, and though it is in line with previous rumors regarding the Zenfone 6, it is such a freaky look. The ZenFone 6 will likely be a pretty typical mid-range Android phone whenever it's released, but it'll be interesting to hear Asus's reasoning for this notch placement. The company will probably introduce two or three ZenFone 6 models at the MWC next year, though we're only guessing based on past experiences when it comes to ASUS' flagship smartphones, and their launch events.